SUMMARY: The old dryer died. This is to inform you of the untimely--or perhaps timely--demise of Mr. Dryer, who joined my household in 1981 just after Mr. Husband. He's been a good member of the household, cheerily removing dog hair from human bedding and mud and gunk from dog bedding for...a long time. His only main repair was right after we got him, when he wouldn't heat in a fit of dryerly pique, but was still under warranty and soon cheerily returned to loading his lint trap with dog hairs of assorted colors. Sometime after 2001, after Mr. Husband had departed, Mr. Dryer's lint trap handle broke off, but I cobbled together a replacement and you'd never know from talking to him that he had any kind of handicap. The replacement handle recently broke off, too, and it didn't cobble quite as well this time. The latch for the door broke a couple of years ago but I was able to buy a replacement inexpensively online and fix it myself, which made me quite cheery. In any event, all those aforementioned possibly bad parts were available online for $50ish each including postage, but I'd either have to pay someone $100 (maybe more?) to replace them, or spend the time myself, and as we all know, I have no time any more except for important things like work, dog agility, and Taj MuttHall. Sometimes eating but I try not to do that too often. And, well, even though PG&E says that I won't save much in energy costs (I guess dryer technology hasn't changed as much as washer technology in the last 27 years--the Sears saleslady says that, yes, they're forced to put energy stickers all over their washers, but no one gives them any info about dryer energy costs), none-the-less Consumers Report suggested that repairing dryers over 7 years old if it cost much money wouldn't be worth it. Seven! Mere infants! Apparently Mr. Appliance Dryer is not merely old, he is ancient, decrepit, beyond imagining in appliance years! But then CU made me think, because they also said that it would definitely be worth replacing if the repair were to cost more than half the replacement cost. Wellllll replacement cost is an interesting thing. I tootled on over to Sears, where I could buy *a* dryer for under $300. 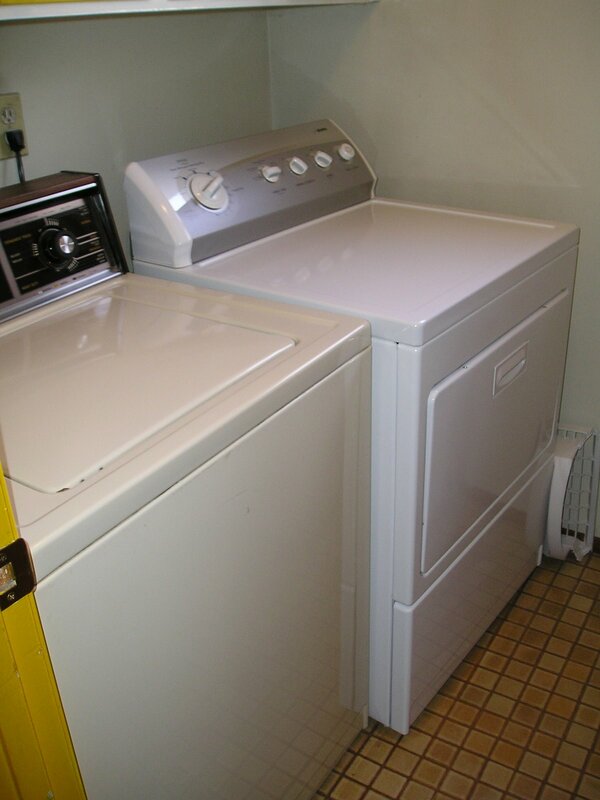 But the rough equivalent of old Mr. Dryer is up around $600 (on sale, with rebates...). Still, I didn't want to gradually use his replacement cost with nickeling and diming, which he has obviously been showing signs of doing. And who wants to deal with a senile dryer, too, which could be the next step? He might leave the laundry in the refrigerator! Or try to dry gasoline-soaked rags, which everyone KNOWS is a no-no! No, too much risk. I ordered white, feeling like I was back in the '60s or maybe '50s. And the instrument panel looks ABSOLUTELY NOTHING LIKE Mr. Washer. 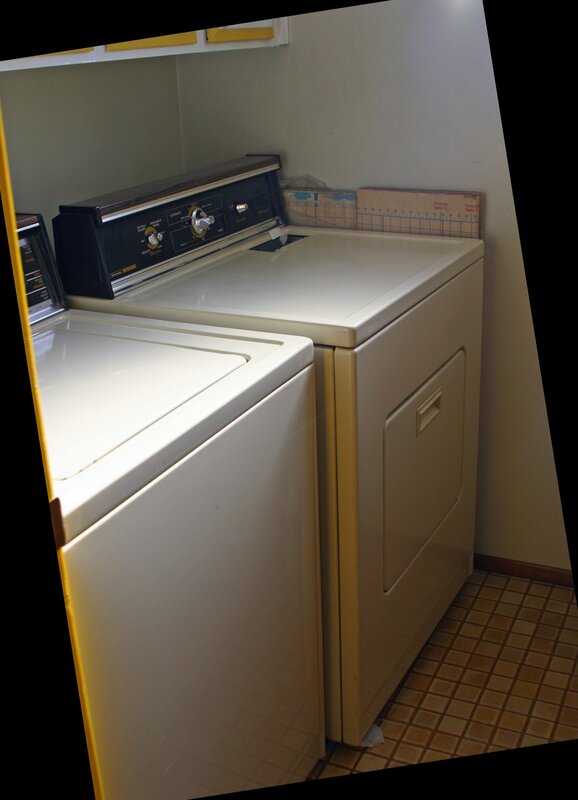 Furthermore, since my walls and Mr. Washer are all off-white (bisque/ivory/well you get the idea), now they all look DIRTY compared to new young upstart Mr. Dryer. It's a sad, sad legacy. On the up side, however, the young upstart Mr. Dryer is much quieter to have around the house; you'd hardly know he was working in the other room. His wrinkle-guard cycle, instead of being "stay on forever until someone notices" mode like old Mr. Dryer, is "tumble briefly every minute or so until someone notices", which is WAY more energy efficient. And his lint trap still has a handle, if you get my drift. I guess there's still no such thing as Viagra for dryers. My washer & dryer have a DNR order because I want one of the blue ones. No wait a red one. No wait a blue one. Either way. I don't care how stupid they look 10 years from now, I wanna blue one, no wait red, no wait blue. But my dryers handles are all, erm, fully functional and I'll bet by the time he needs Viagra the trends will be back to avocado and urine yellow. You mean "goldenrod." Like my current stove (more on him some other day). Like my first refrigerator. My current fridge is bisque. No, almond. My current dishwasher is white. I love blue. But not in appliances. Red? !